Thread in 'Research & Development' started by IoannesPaulus, 3 Aug 2012. 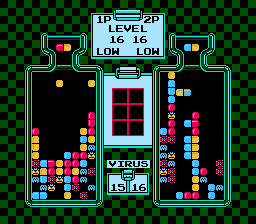 I've added information about capsule generation, virus generation and just now how the gravity works to the Dr. Mario wiki article. Check there for a description of how the game works. Cool stuff. Thanks for doing this, nightmareci. Could you please explain some more about how the gravity works? So what does this 6 mean? Does the speed increase by 6 units? Or is it like 1/6 = 0.1666...G? and the highest index be when the speed counter tops out on HI, 31+49 = 80? Anyways, really awesome work! Very interesting to read. The entries in the gravity table are in frames per row, so 6 means the capsule will remain in the same row for 6 frames before dropping one line. I've edited the wiki page to include this little detail. I'll have to analyze Dr. Mario a bit more to figure out the maximum index, and see if 80 is the real maximum. I know the index minimum must be 15, but the game stores indexes 0-14 in ROM, so I included those values in the gravity table. And if 80 is the real maximum, then some random byte in ROM after the gravity table is the number of frames per row for index 80. Okay, cool. So if it's frames per row and 79 is the highest index then 70 would in practice be the point were speed didn't increase furthert, since both index 70 and 79 corresponds to 1 frame per row. However, I got inspired by this and so I played 20 HI just now without clearing all the viruses, and waited till 490 pills, and I must say I definitely felt an increment in speed around that value(counted in my head while playing so I don't know about the exact value). It went from playable speed before 490 to crazy speed after 490. It felt like the game wouldn't let me move the pills fast enough to be able to continue on playing. So I got maybe 30 more pills before I died. I just checked back here after a long while. Please do post the link when ready! I'd love to beta test it. Generate a random number in range [1,16]. If the random number in step 1 is greater than the maximum allowed row (seed the "Virus Level"/"Maximum Row" table above), go back to step 1. What is the purpose of this? Why not just generate a random number in range [1, Virus_Level.Maximum_Row]? Is it because I'm on an x86-64 machine and this was intended for 32 bit machines? I guess it doesn't really matter since the pseudo code is available on the wiki. How does the 2p revenge system work? Unless it's because more than 4 consecutive cells being cleared, it takes higher precedence? The last thing(I think) is the placement of the punishment blocks... It doesn't seem to follow any pattern!? Is it really just random and I'm overthinking it? I've also noticed that if blue is cleared first, followed by a red, then blue will always be left of the red on the opponent's screen. Sorry, I just checked out the test script, and it turns out I had defined VIRUS_LEVEL as 0, instead of 20, which was what was used when the test.txt file was generated. I've also just compiled and tested on my x86-64 system, and the test script outputs nothing (which is what should happen, if the bottle program's output is identical to test.txt). After looking over bottle.c, nothing in it looks CPU-dependent, so it should work on any platform. 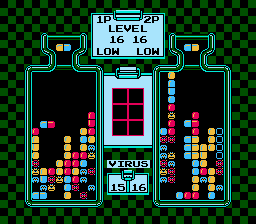 I've attached the same drmario.zip package as before, but VIRUS_LEVEL defined as 20. I didn't think of investigating the versus behavior, but I'll work on that. Sorry to bump this out of nowhere, but I'm working on my own Dr. Mario clone as programming practice for a casual game jam, and happened upon the Tetris Wiki explanation of the algorithm. First of all I'd like to just say I think it's amazing that people will dive this deep and share the information, thank you so much! However, I'm having trouble implementing the algorithm myself. I looked through the C code nightmareci provided but my only experience is in self-taught C# and I have no clue about bitwise operations etc. so it is almost impossible for me to follow. 1. Treating Y=1 as bottom and Y=16 as the top (Step 4), doesn't the loop in Step 7 result in pushing things above the earlier defined maximum top row, if the Y value is indeed incremented? 2. When step 9 returns to step 7.1 specifically skipping the loop, doesn't this mean that from then on, there is no check if the new incremented cell position is filled or not? My literal implementation currently overwrites cells with already placed viruses, resulting in the wrong amount. In any case, this is already way more information than I expected to find on this very specific problem, so thanks anyway! Here's a C# version of the virus generator, in a command line program. It's my first C# program (I learned C# just to write it), so it might be ugly, but at least there's no bitwise operations. colour_thief, Qlex and Kitaru like this.